Are you a fan of playing QuiBids Games for Voucher Bids? Well today is your chance to meet one of the guys who builds our games for you to enjoy! 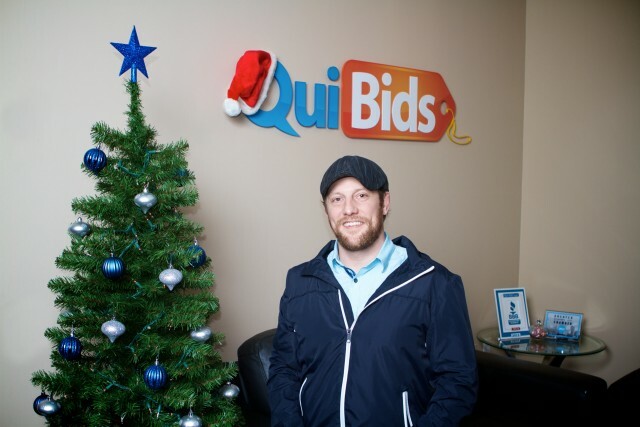 Josh Longbrake is one of our application developers, but more importantly he’s the QuiBids Above and Beyond Employee for the month of December! Take a few minutes to read our interview with Josh and tell him congratulations down there in the comments! 1. Tell the good people of the QuiBids blog what you do here, and when you started doing it. Aside from playing online games all day, I tend to develop some as well. I am part of the games team and help create the games our users can play after winning an auction, to, in turn, win more bids in which they use to get more Gameplays. I have been here since March. 2. If it turns out that tomorrow really is the apocalypse as the Mayans have predicted, then what’s your last meal gonna be? 3. Which member of the QuiBids tech/development team do you like working with best and why? 4. Favorite spot to kill a few hours here in Oklahoma City? Having kids makes a few spare hours next to impossible, but if said hours were available I would probably catch a local band, grab a few drinks with some buddies, or catch a game (Thunder, Sooners, etc.). 5. If you had to guess what song have you listened to most in the last six months? As a self-deluded, wannabe rockstar musician, music can dictate many of my moods and emotions directly from the song that is currently destroying my eardrums, much to the dismay of “some/most/all” of my co-workers. I am usually tuned into one of my many Pandora stations and at the moment I am listening to Nine Inch Nails. Now it’s Glitch Mob. Really I like anything with that’s up tempo with a good beat to code/develop to. 6. Other than your freshly minted Above and Beyond Employee distinction, what’s an accomplishment here at QuiBids that you’re particularly proud of? Making games can be more than it seems, so anytime we can take an idea and turn it into an actual functional and enjoyable experience (final, final release) is a win in my book. 7. Hypothetical situation: Your boss comes in unexpectedly and gives you the afternoon off. What do you do with the free time? First, I would probably try and coerce some of my coworkers into an extended lunch, then find the nearest watering hole and catch up on some much-needed sportscasting. Unless my better half finds out, and then I would love nothing more than to spend the afternoon with her, which means watching the kids while she regains her sanity. 8. Baseball, basketball, football, or other? I’m a huge football fan, BOOMER! I wasn’t a big basketball fan (having been a wrestler most of my life), but with the Thunder in town, I’m completely hooked. By the time baseball rolls around, I’m ready for a low-tempo sporting event, so its fits well. All in all, l would say that I dig sports. 9. What qualities do you prize in people you work on projects with? Good communication skills, and, sometimes, the lack thereof, if you catch my drift. The knowledge that in every corner of the company, you are working with the best in their respective fields as well as being able to work with the latest technologies as they come out. To us tech geeks new software/technology has the shiny penny effect.